11 research groups were established by the Lendület Programme in 2016. 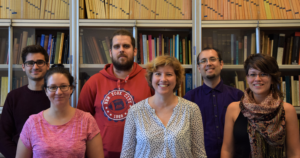 One of these is the MTA-ELTE Lendület (Momentum) Lingual Articulation Research Group at the Department of Phonetics of the Institute for Hungarian Linguistics and Finnugristics, Faculty of Humanities of Eötvös Loránd University. The main goal of the research group is to analyse coarticulatory effects in Hungarian sound clusters. Coarticulation is a natural phenomenon in connected speech, it may be defined as the overlap of the articulatory gestures of neighbouring speech sounds. The tongue as an organ in our body is usually regarded as one unit; however, its specific regions (tongue tip, tongue blade and tongue dorsum) may behave as different articulators. Therefore, lingual coarticulation refers to both the simultaneous and connected gestures of the tongue and other articulatory structures (e.g., lips, jaw, velum, or glottis), and also to those of the particular regions of the tongue. Hence, lingual coarticulation is a diverse field of research that may be approached from many perspectives.